Session 274. A nice sea breeze came in late in the afternoon at St Kilda. Stuart and I headed down and found it surprisingly quiet. The boats in the marina now come right past the sand spit so the "kiddies pool" is quite hard to get to now. Once on the water we took off for a tour over to Hobsons Bay. The Spirit of Tasmania was turning to enter its channel when we scooted across. We nearly made it to Webb Dock but the wind was a bit lighter over there so we came straight back, with the Spirit of Tasmania now departed and some distance down the bay. Riding strapless seems to require more leg effort to control the board, there is no "lazy option". I did notice I was leaning back more on my natural (left) tack compared to my goofy (right) tack, so I made an effort to relax my legs a bit on the right tack and use my body weight more. 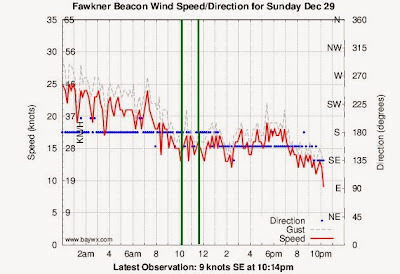 The wind was consistent but not strong. I had plenty of power on my Lithium 12. Downloop turns were the go on the swells to keep some board speed up. I tried one duck tack and nearly looped the kite. We did quite a few runs closer to St Kilda West before coming in. A nice session - back to where I started from and challenging in its own way. 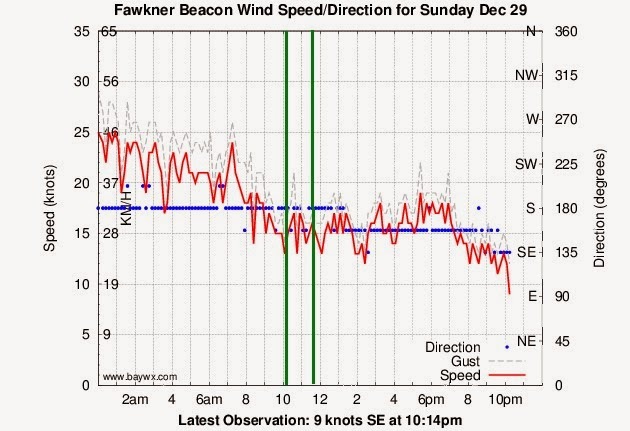 The wind forecast on Predictwind looked ominous for Saturday, and they were right. Hot northerlies in the morning were blown away by a massive cold front that ripped in during the afternoon. 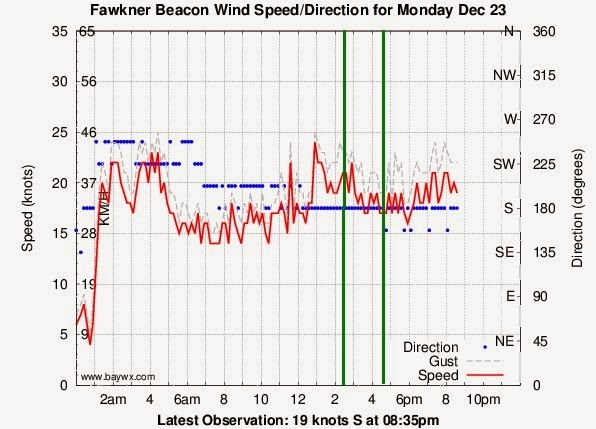 The wind speed changed from around 15 knots to 40 knots, with gusts reaching 45 knots. This was a good day to not be kitesurfing! Session 272. 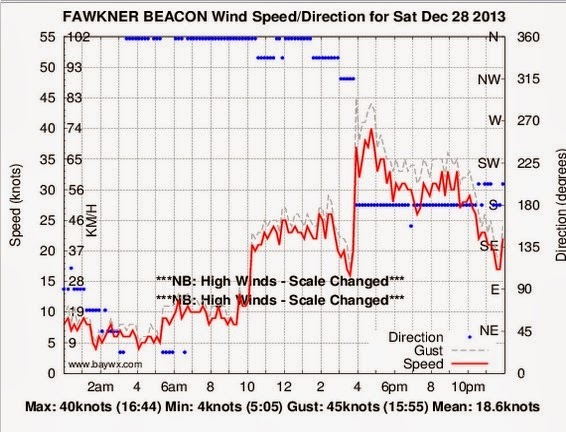 A good sea breeze of around 25 knots sprang up around 4pm. Here was a great opportunity to work off the excess food intake of Christmas Day. Hampton was the place to be. Stuart and James got there a bit before me and were already on the water along with about a dozen other kiters and several windsurfers . I headed out the the marina sea wall and caught some of the waves breaking around it and then headed in on the flat water. I did a couple of jumps nice jumps then surfed the sell back past the first groyne to the beach section. There were some good swells coming in there - I caught a couple of nice waves, then headed on along the beach following the reef breaks. There were good waves at Green Point and only a couple of kiters there. I then worked by way back to Hampton, getting some nice waves on the return trip too. 25 knots produces quite a reasonable swell with some good surf. There was even a couple of surfers out off Middle Brighton. My back (right side, near top of pelvis) is giving me some grief but this session was too good to miss. I might have to rest up for a couple of days now though. Session 271. An epic session - 34km of fun. We were considering doing a downwinder from Frankston to Mentone. However, when we arrived at Mentone there was plenty of wind onshore so we decided to do a return tour up Aspendale. The wind was solid onshore 20+ knots so I took my Lithium 9. Getting off the beach though the bay surf at Mentone was a bit of a challenge, but once behind the waves the going got easier. The wind was stronger too - there is a bit of a wind hole at Mentone. Stuart was ahead in the distance. I got around the pier about 50m out, we continued on up to Gnotuk Ave Aspendale. There were about 10+ kiters out there and the waves were good. We kited and surfed the waves there for a while then headed back. I had some myotherapy in the morning, including some dry needles in my back and glutes so I was feeling a bit sore and tired after cranking upwind to Aspendale. Downwind was great. There was the good occasional wave and downloop turns kept me motoring along. I did one big boost off a wave heading out and had a big crash, happy to be wearing my shorty, vest and helmet! There is a big rolling swell on the West side of the pier which is nice to surf, then I cruised back along the surf line to Mentone. An epic session. I am a spent force now, and very happy!